BLUETOOTH/ HANDS FREE CELL PHONE **, BACK UP CAMERA **, CLEAN CARFAX / NO ACCIDENTS REPORTED **, TWO SETS OF KEYS **, DEALER SERVICED **, F-150 XLT, 4D SuperCrew, 5.0L V8 FFV, 6-Speed Automatic Electronic, RWD, Steel Gray w/Leather-Trimmed 40/20/40 Front Seat, 18" Chrome-Clad Aluminum Wheels, 4.2" LCD Productivity Screen in Instrument Cluster, 5" Chrome Running Boards, 6-Way Power Driver Seat, ABS brakes, Chrome Door Handles w/Black Bezels, Chrome Exhaust Tip, Compass, Electronic Stability Control, Heated Power Side Mirrors, Illuminated entry, Leather-Wrapped Steering Wheel, Low tire pressure warning, Power Adjustable Pedals, Remote keyless entry, Self-Dimming Rear-View Mirror, SYNC MyFord, Traction control, XLT Chrome Package, XLT Convenience Package. 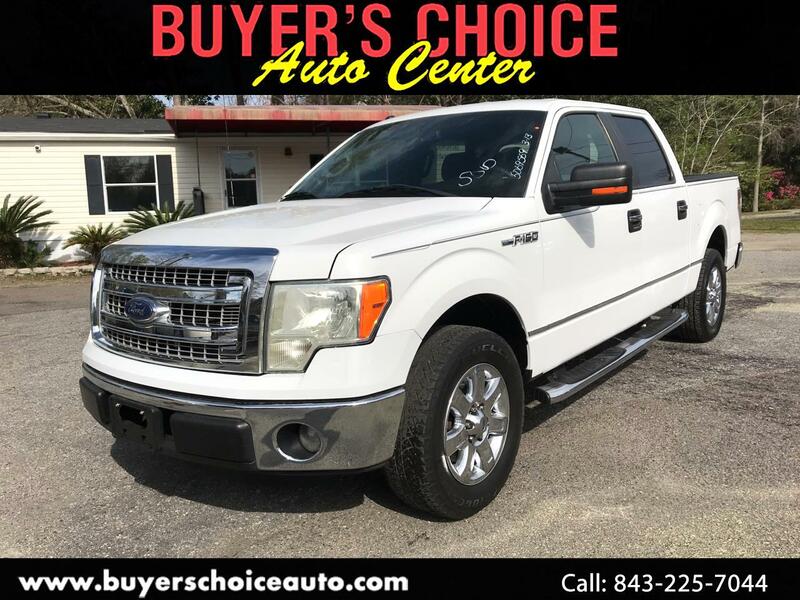 White Platinum Metallic Tri-Coat 2013 Ford F-150 XLT RWD 6-Speed Automatic Electronic 5.0L V8 FFV Awards: * 2013 KBB.com Brand Image Awards Buyer's Choice Auto Center is family owned and operated pre owned car dealership located in the heart of Summerville, SC. We have been in business for over 15 years this April. Larry McLain and his wife Laura do it all here at Buyer's Choice. Buyer's Choice specializes in rare late model Land Cruisers, and Land Rovers. We also carry a great selection of pre owned vehicles, and we price them very aggressively. Most of our vehicles are sold at or under trade in value. That is because Larry does all the buying at auctions himself. Please feel free to contact us or stop by the dealership anytime to check out our amazing inventory. We have some of the most unique inventory in the Charleston area!!!! Be sure to visit our virtual showroom of inventory available for purchase. There you will see detailed information about each vehicle, a picture gallery, as well as convenient ways to contact us for more information about that vehicle. We are located at 902 N Main St and are available by phone at 843-225-7044 . You can also get driving directions and hours of service from our user friendly website https://www.buyerschoiceauto.com/ .